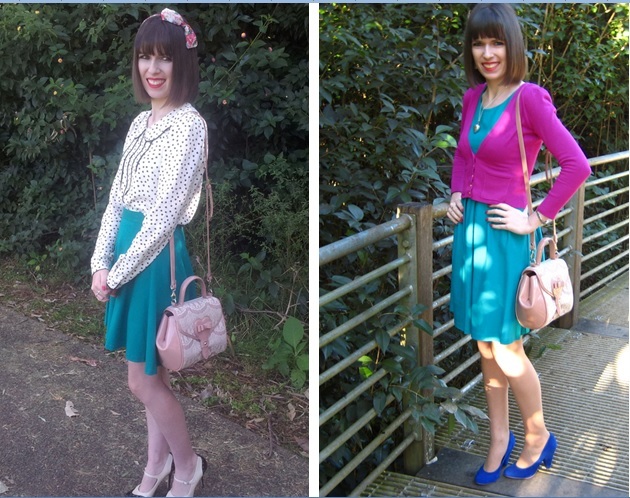 It’s time for another remix post and on this occasion it features my ‘A Lacy Affair Bag’ from Alannah Hill (a very deserving piece because I’ve had so much use from it). I received it as a Christmas present back in 2010 from my mother in law. I was especially surprised, happy and excited. 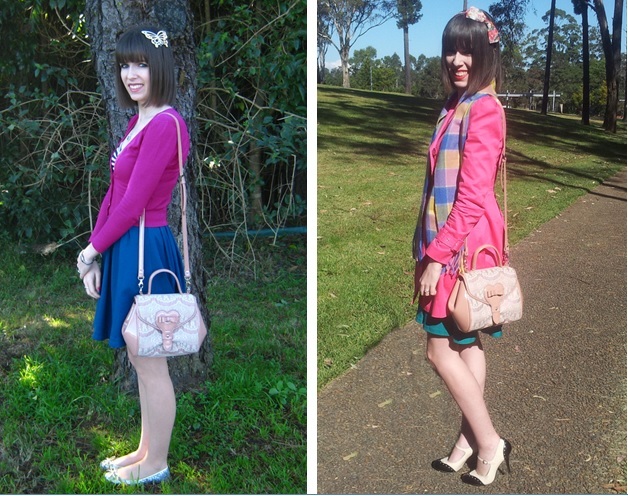 This was back in the day when I rarely owned anything from Alannah Hill and I didn’t have expensive bags (long before my obsession with Guess bags began) so it meant the world to me. 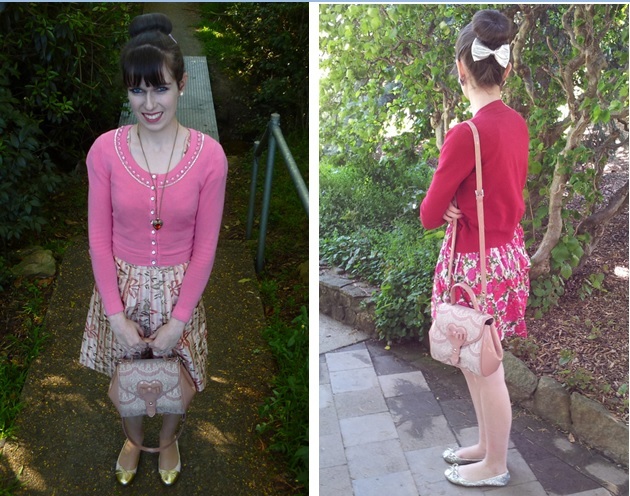 I believe my ‘A Lacy Affair Bag’ represents my style accurately because it’s so girly. I adore the beautiful lace, the lovely bow and the pretty shade of pink. It's a really cute bag & I love how you styled it in each of the outfits. You have some really cute cardigans. This is the perfect bag for all these outfits! Great color and texture. I'm a huge fan of skirts too and yours have fun patterns and color. Lovely post. Your outfits are so cheery and colorful! You have a knack for remixing items too!! Hi Imogen…I almost forgot about the pretty bag because I was too caught up admiring all your beautiful and vibrant outfits! Thanks for sharing your fashionable thoughts on my last post. Happy Weekend! 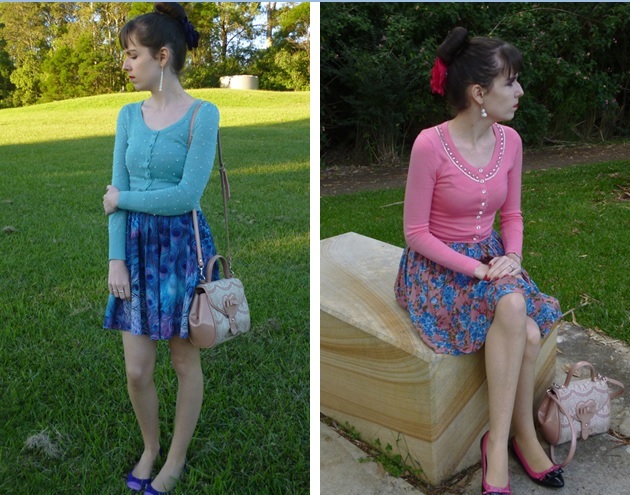 I really like all these outfits and I think your pretty little lace bag matches each of them perfectly! I especially love your pink cardigan with the small details! Such a lovely bag. The lace on it is so pretty. I love all the different ways you've styled it. You always wear such lovely colours. Really beautiful looks! Love your style! Thanks for the visit, I really like your style. we can follow each other if you want. That is a very pretty purse and it's clear you've gotten plenty of use out of it! What a very cute bag and really so versatile!! I love cardigans so your outfits are fabulous in my opinion. That bag is definitely very versatile with the neutral colors and lovely lace detailing. I can see why it's a staple in your closet. Have a late really Happy New Year to you! I wish your dreams and your Goals come through 2014 for you!!! I love how colorful you are! It's so hard for me to be bright with my outfits and you make it look so easy! Your feminine style is so lovely! I love all the spring-inspired colors you wear! Gorgeous bag, and definitely versatile! I love all your hair accessories, too! So many darling outfits! I am so in love with your style, you always look so gorgeous. wow, so many great dress/skirt outfits! You are so good at styling these! And I agree that the bag is pretty timeless and versatile! Shoes on the last photo are amazing! Such pretty pieces! Your hair down looks so cute! u are always so chic! The bag is really amazing! It matches so many outfits and it is really beautiful, no wonder you love it even after a lot of time has passed.